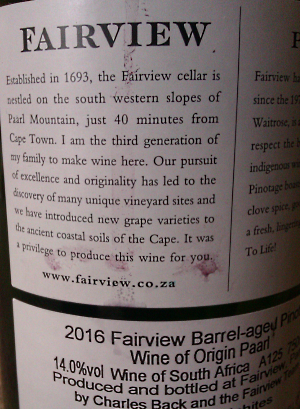 My Wine of the Month for April is Fairview ‘Barrel Aged’ Pinotage 2016. The label is slightly different from the one on Fairview’s site and the back label says it’s an exclusive bottling for the UK supermarket chain Waitrose, but whether the contents are really any different is a trade secret. 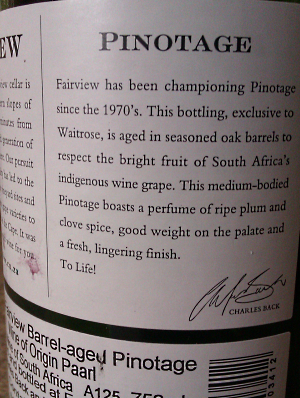 The regular bottling has ten months aging in 15% new French and American oak barrels (same as this wine according to Waitrose’s website), and the abv and WO are the same. It was good to see Fairview on the shelves, looking back it seems my purchases in recent years has been at the winery, presumably as a result of not seeing them at home. 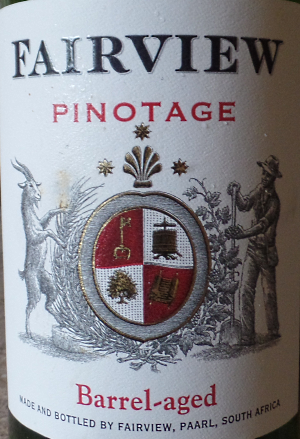 This deliciously enjoyable wine had all the hallmarks of good Pinotage: lashings of ripe plum and berry flavours with a spicy edge and a backbone of gentle tannins. Excellent with chicken tikka jalfrezi. Emile Joubert says that François Naude’s Le Vin de François is now a true icon after 11 years. Eleven years after launching his unique Pinotage under the Le Vin de François label, legendary wine maker Francois Naudé is seeing his annual once-off offering taking its place at the top of South Africa’s wine offerings, both in terms of quality and in the high-end prices the wine commands. Read my report of the 2017 auction here. A decade or so ago when I was judging at the Veritas awards, one evening I went with a large group of judges for dinner to Cape Town Fish Market restaurant in Stellenbosch. With us went two boxes of opened wines, left overs from the day's judging panels. It was a pleasure to at last swallow wine instead of spitting, and to see the label so we knew what was in our glass. I had Cob, a fish new to me, simply pan fried. It was a delicate, sweet white fleshed. I sampled many of the two dozen wines we'd brought. But the one I returned to and settled on was the delicious Wellington Wines 'La Cave' Pinotage. Red wine and white fish and it made a perfect fit. "I was already salivating at the thought of the perfumed red elixir chasing the oily, robustly flavoured morsels of marlin. Game-fish and Pinotage are the perfect match. Just as Ernest Hemingway is inseparable from short sentences, boxing gloves and serial marrying, so a steak of marlin finds its match with Pinotage. The L’Avenir must be one of the finest examples around, the velvety, red-fruit notes and the mouth-loving texture making the fish swim again, this time through a sea of gorgeously graceful wine flavours." Click here to read Emile's article 'The Old Miller and the Marlin'.